Deeply penetrating clean, pore refining, herbal nutrition for your skin…These are all words on cosmetic descriptions. This product may do these things, it may just be a scrub. Frequency of use will depend on skin type. If you want you could use as a Masque. Rinse off with warm water or in the shower. 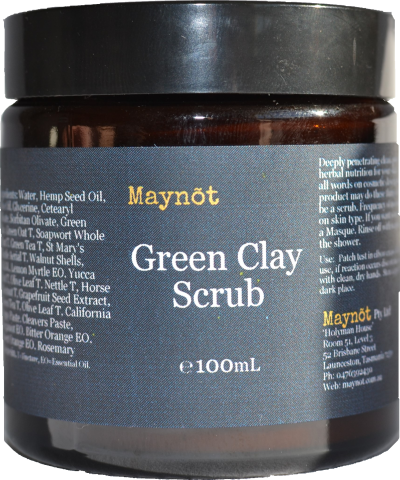 Ingredients: Water, Hemp Seed Oil, Olive Oil, Glycerine, Cetearyl Olivate, Sorbitan Olivate, Green Clay, Green Oat T, Soapwort Whole Plant T, Green Tea T, St Mary’s Thistle Aerial T, Walnut Shells, M.S.M., Lemon Myrtle EO, Yucca Root T, Olive Leaf T, Nettle T, Horse Chestnut T, Grapefruit Seed Extract, Green Tea T, Olive Leaf T, California Poppy Paste, Cleavers Paste, Bergamot EO, Bitter Orange EO, Sweet Orange EO, Rosemary Oleoresin. T=Tincture, EO=Essential Oil.